It’s hard to exactly pinpoint where the resurgence in popularity of bluegrass music in the last fifteen years has come from. Perhaps it has to do with American’s wanting to reconnect with roots music. It could be that it blends vocal elements of folk music with musical complexity of jazz and classical composition. Perhaps people are just plain sick of what has been coined now as “country”, which appears to have transitioned into electric big-band steel guitar nonsense with even shallower lyrics. Whatever the reason may be, live music goers are seeking out further complexities than that tired old story of a pickup truck and loosing your girl. Plain and simply: bluegrass is music appreciators music. The originators of the style had a set formula that would be abided by until the late 1960s. The likes of musicians like John Hartford, Sam Bush, David Grisman, and Tony Rice embraced the traditional sensibilities of Bill Monroe’s stylings while furthering the medium in each their own way. When a new generation of bluegrass performers emerged on the live scene around the turn of the century, a third generation of “newgrass” performers took the genre to even crazier fusion territory. Bands like “Cornmeal”, “Trampled by Turtles”, “Head for the Hills” amongst others embrace the traditional elements but have incorporated Rock and Blues music into their sound as means for further musical exploration and possibilities. One of the most exciting retrospectively newer bluegrass bands is Kalamazoo, Michigan’s “Greensky Bluegrass”. They are certainly amongst the ranks of those mentioned above. Formed in 2000, but truly emerging on the scene around 2004 with the release of their first album “Less than Supper”, the non-changing quintet has established themselves as forerunners in this new generation of bluegrass mainstays. Greensky Bluegrass is: Anders Beck (Dobro), Michael Arlen Bont (Banjo), Paul Hoffman (Mandolin), Mike Devol (Bass), and David Bruzza (Guitar). Though they have been touring extensively since 2005, their real break was winning the prestigious Telluride Bluegrass Festival’s Troubadour contest in 2006, a contest that has launched careers for the likes of “Larry Keel” and “Trampled by Turtles” amongst many others. The band is proud of their new release and third studio album to date “Handguns”. The brand new “out of the shrink-wrap” album is hard to describe as traditional. Only three of the cuts on the album are less than three minutes long. All songs feature vocals from Bruzza and Hoffman and seem to tell stories reminiscent of how “The Band” used to. The plight of the worried man, struggling through the time and place that he thrives in and finding his place and bearings through the tribulations that life brings. In some ways the fourteen-track album could be considered a tad morbid. I choose to view their latest effort as maturation in songwriting ability and a look at life from the side of triumph over loss and regret. The studio album recorded from their home state in Lansing, Michigan, clocks in at nearly an hour and ten minutes. The range of variety in terms of musicianship versus folksier elements is one of the albums great successes. The albums opening track “Don’t Lie” starts with dobro chops from Beck and sets the tone properly for the rest. The meaner instrumentally complex track such as “Cold Feet”, “Better Off”, and the albums twelve minute closing song “All Four” are balanced well by the heart-wrenched lament “Beauty and Pain”, the allegorically thick “Jaywalking” and the title track “Handguns” which sounds musically like a Gram Parsons throwback illustrating old-west thematic allusions. The album also embraces the highs and lows of living, back to back. Example being “No Idea”, a self-forewarning tale of the detriments of destructive behavior dealt with through the triumph of the human spirit. It is followed immediately by the lighter jovially spirited “I’d Probably Kill You”. Humorous in nature and punched up by a horn section, it is one of the musical highlights of the album. Though the disc has some excellent instrumental breakdowns and agreements, the lyrical complexities are what really make Greensky’s new outing shine above. Musically, Beck’s heavy dobro soloing and Bont’s banjo licks rise highest in the mix of the five talented folk musicians. 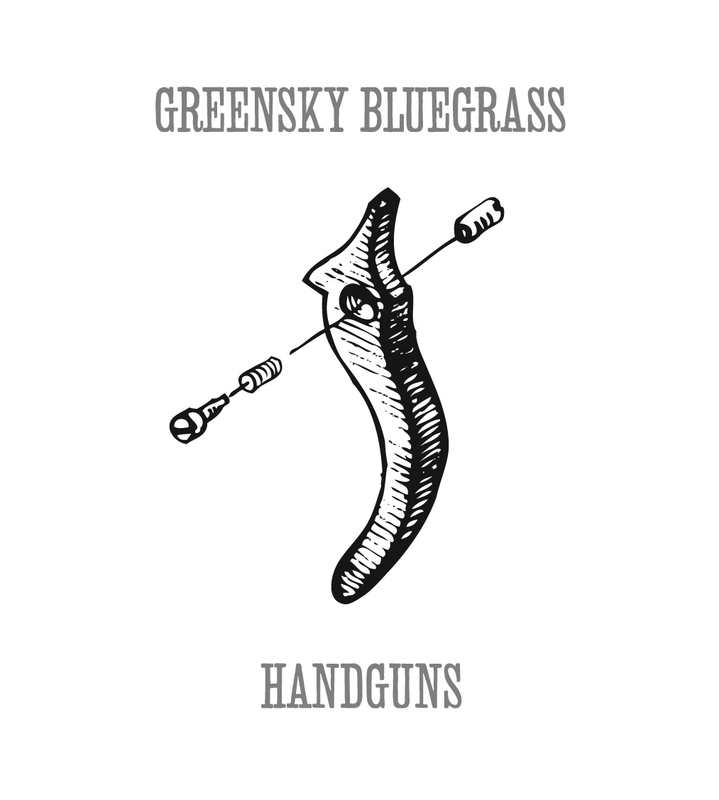 For “Handguns” is truly a bluegrass folk album. Rather than giving their newest story away in full, do yourself a favor and go ahead, pick up a copy of their newest disc. It is equally important to support studio efforts as well as attending live shows. Having only seen “Greensky Bluegrass” once at Boulder’s Fox Theatre, I am excited to support their next outing, and how the new material works itself into rotation. Cheers to your greatest studio success to date.